To carry out research within specific newspapers, go to Find Library Resources: Journals on the library home page and search by newspaper title. You'll find access to all our online newspaper titles here. We also have news titles in microfilm and print. Find full coverage (in all formats) by searching newspaper titles in the Library search box. On the left in the results list page, you'll find ways to narrow down by format. To find newspapers by location, go to Classic Josiah and do a subject search on: Newspapers [City]. See the full list for examples. Not sure what to do? Have questions? Ask a librarian! Use our online chat, email, call, or text us. Edwaert Colyer. 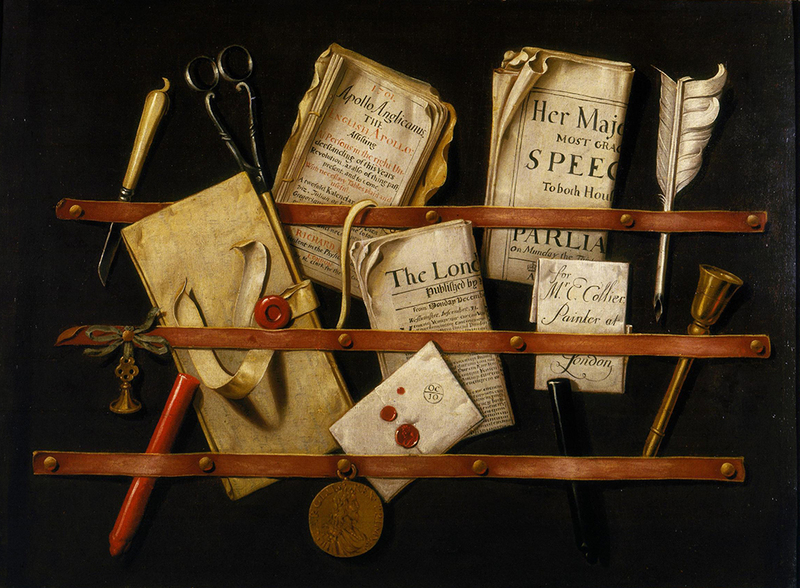 Trompe L'Oeil with Writing Materials. oil on canvas, ca. 1702. Courtesy of the Victoria & Albert Museum.